Site inspections are a crucial aspect of any location-based endeavour. From estimations to orientation to location scouting, site inspections are a critical part of your business. When scouting for future development, a movie set, or any other outdoor location, access to Wi-Fi is usually severely limited. QuickTapSurvey allows you to conduct your site inspection offline wherever you are. Whether you are building a condo on the moon or scouting an ocean set for a movie, your data will sync whenever you have internet again and automatically be uploaded to your account. If ten people are scouting ten different site locations on clipboards with pen and paper, that is ten different data sets with ten different kinds of handwriting. With an offline site inspection form, that data will be uniform and you’ll never need to input information manually. 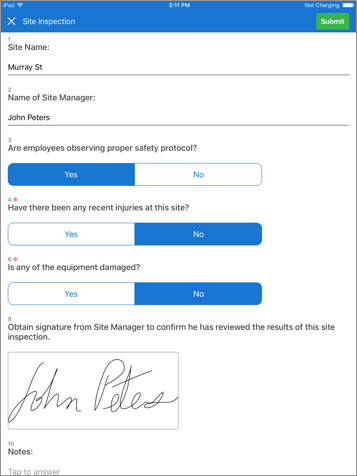 With QuickTapSurvey, you can customize this site inspection form template or quickly create your own for site inspections anywhere. QuickTapSurvey can complete site inspections anywhere. Site inspection forms can be easily customized, re-configured, and reused to suit inspection needs. The more uniform the data, the more useful it is. Conduct the site inspections you need to get the job done using QuickTapSurvey as your site inspection app.